I wasn’t sure whether I should include today’s game as a home brew as it’s creator, Gemini (Kris Asick), has produced commercial games. From the file date it was made sometime in November 2017. He made it using QBasic during a live stream, which is certainly interesting, unfortunately there doesn’t seem to be a recording to watch now. 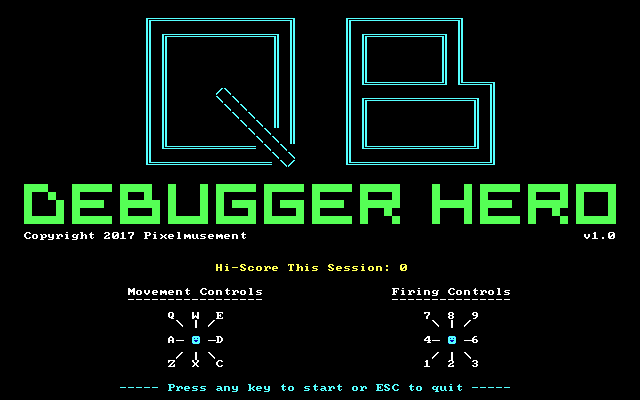 QB Debugger Heroes is a fairly simple Robotron 2084 clone using text mode for graphics and lacking any sound effects. This is relatively common for games implemented using gwbasic or Qbasic languages as it makes development much faster, and whilst there are graphics commands they don’t generally perform well so aren’t suited for action games. Although it is technically possible. Whilst it’s just textmode style graphics, they are nice to look at and includes some basic animation that looks quite nice. The game controls requires the numpad on your keyboard, so you won’t be playing on a laptop. It works kinda like the twin stick design of the arcade game, with two clusters of keys, one for movement and the other for directing your fire. However unlike a real joystick each keypress changes your movement and gun fire, but you continue moving and firing in that direction until you press a key to change it. This is partly because of limitations within Qbasic when reading input from the keyboard. For best results I suggest using a modern machine with Dosbox to run it, as you’ll be able to adjust the speed as needed. 30,000 cycles was suggested and is about right for a faster more challenging play experience. If you’re playing on real hardware you’ll need a Pentium era machine to get a decent challenge. Older 286 and 386 machines will work, but it runs slower and will be significantly easier. 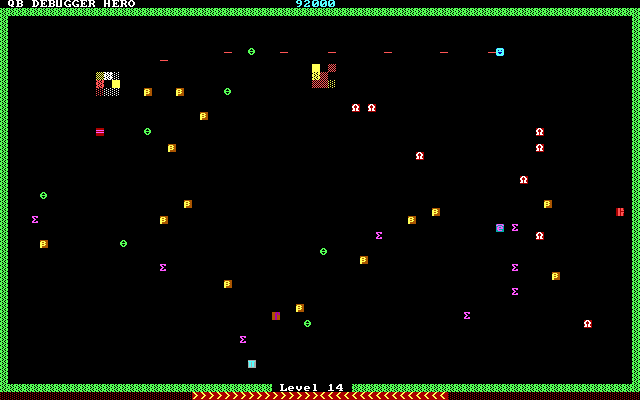 The game play has the main elements of Robotron, but is simplified and has some elements removed. Like the arcade game, enemies spawn in continuously (in short bursts) and you finish a wave when your destroy a set number of them. However it appears there are fewer enemy types and there aren’t any humans to rescue. This was to be expected as it was developed in a relatively small time frame, and additions such as those would have degraded the game speed. Difficulty ramps up with each wave mostly just by number of enemies present. Obviously QB Debugger Heroes isn’t anything special as far as Robotron clones go, but it is a good example of what can be done fairly quickly with a language like QBasic. Gemini has managed to create a reasonably faithful Robotron clone that is polished in 6 hours, which in my book is pretty darn impressive. You can find a download for it on his website. 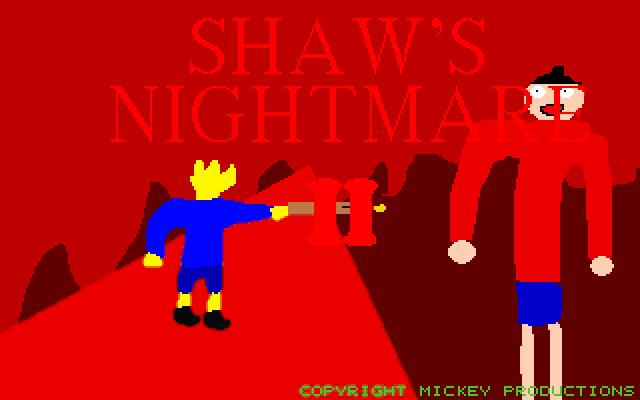 Today I’m taking at look at a sequel to the homebrew game Shaw’s nightmare, simply called Shaw’s Nightmare II it was released by Michael Muniko in 2016. There is much in common between the two games, such as being made using the Build engine and being heavily inspired by Doom, Doom 2 specifically in the case of the sequel. Firstly there are a few things I didn’t notice when playing the first game that apply equally to both. They support VESA graphics with resolutions higher than the standard 320×200 VGA, today I’ve used 640×400, although you can go as high as 1024×768. The sprites look a little better with higher resolutions because the scaling doesn’t cut out as much detail. Also items in the game are rendered using a voxel engine that is part of the build engine. Running at a higher resolution seemed to required more processing power, it worked reasonably well under dosbox with 60-100k cycles. Later I found turning the cycles up to maximum helped with another issue. Artistically nothing much has changed in the sequel, although there are some new enemies and a new weapon which fit in well with the pre-existing art style. The main improvement comes from the level design, which has better enemy placement and level layout, creating less issues with sprites clipping and blocking your view. There are a couple of levels which are clearly inspired by some found in Doom II. The basic sound effects are much the same as the first game, however there seems to be some improved music. It’s no symphony, and the quality varies by song, but it’s generally better than the first game. The controls still suffer from input lag, and a little bit of sluggishness in the movement of the player. I tried using the mouse in combination with the keyboard, but found difficulty with mouse sensitivity. The demo in the game suggests it’s possible to get something more functional, perhaps requiring more processing power to reduce input lag. I tried setting dosbox to maximum cycles and it helped, but didn’t eliminate the problem. Shaws Nightmare 2 is an incremental but significant improvement over the first. The control lag is still an issue, but it’s more playable. After getting used to the control issues I did start to have some fun. If you want to give it a try you can find it on the authors website here. Todays game is very well known, and can be considered the grand father of the FPS genre. 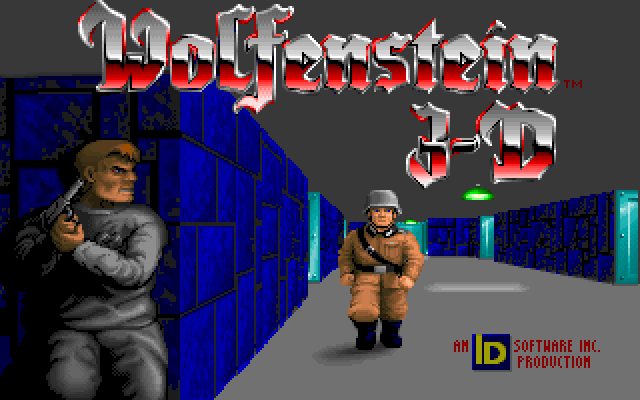 Wolfenstein 3d was released by id software in 1992. It was extremely popular, selling both in the retail and shareware markets, and received several significant awards. The engine was licensed out and resulted in a number of other games, some I’ve already covered such as Blake Stone and Corridor 7. It inspired others to make similar engines and games of their own such as Nitemare 3d and Ken’s Labyrinth. In this way it really spawned a whole generation of FPS games. It wasn’t without controversy, partly because of the Nazi imagery used as well as the Nazi party anthem being used at the title screen. Because of this some rules were changed in Germany which resulted in the game and some other media being banned there until quite recently. It was also quite violent compared to contemporary games, although looking at it today it is comparably tame. 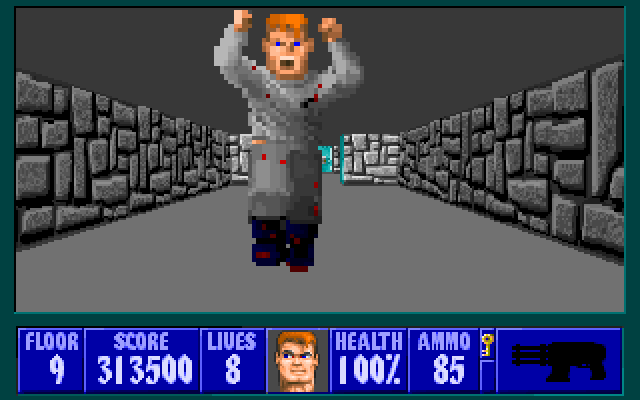 Today is actually the first time I’ve really sat down and played through a significant portion of Wolfenstein 3d. I’ve had brief encounters with the game in the past, but never really sat down and spent some time with it. I played through the entire shareware episode in a little over an hour total play time. You need a VGA graphics card and at least a fast 286 machine. I’ve found that 3000 cycles in Dosbox (roughly a 20Mhz 286/386sx) is sufficient to run the game with the maximal screen size and a smooth frame rate. I quite like the art style, the UI elements are generally very minimalist in a pleasing way whilst sprites and textures are detailed and make good use of colour. It’s impressive in both an artistic and technical sense. The sound effects are a mix of digitised and adlib sound effects, which generally sound quite good. Although it seems that it can only play one digital effect at a time, which can result in odd sound when in a noisy situation such as lots of nearby enemies. The adlib music is quite good and adds quite a bit of atmosphere to the game. Although I was startled to learn the music used at the title screen is the Nazi party anthem. There are three different options for control, keyboard, mouse or joystick. I used the keyboard for my play through, mainly as I did it on my macbook. The keyboard works fairly well mostly, but sometimes doesn’t have the aiming precision sometimes. Using the mouse and keyboard works much better, but it wasn’t an option for me this time. The game play is pretty simple, basically you search a maze like level for the level exit. Along the way you have to gun down enemies, pick up ammo and health as needed, and collect various score items. There are some locked areas which require a key, which are usually found simply by exploring a level. Because of their maze like structure and how many areas look similar it can be easy to get disoriented and totally lost. There is a simple maze solving algorithm that can help, simply stick to walls on either the left or right hand side. This works well for the majority of the levels, only slipping up where there is a loop in the maze. 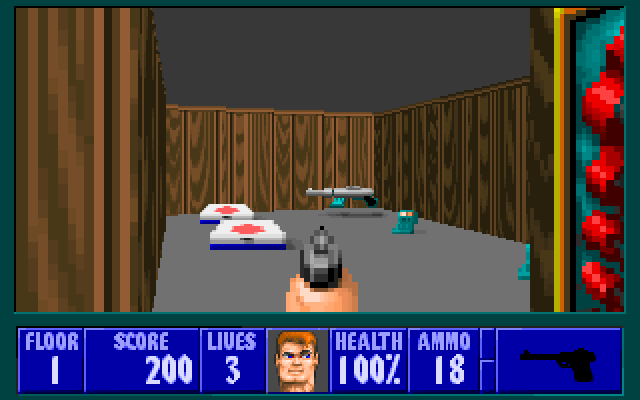 Guns are an important part of every FPS game, Wolfenstein 3D has 4 basic weapons. The knife, pistol, sub-machine gun, and a rapid firing chain gun. The best weapon for most use is the sub-machine gun as it’s fast firing, but not so fast as to chew up all your ammunition. The chain gun tends to eat ammunition too fast, so is only really useful when fighting the bosses or a large group of enemies. The pistol and knife are basically starter weapons for when you’re low or out of ammunition. So how does Wolfenstein 3d hold up today? I’d say it holds up fairly well, although there are some issues. The game play works very well, but does get repetitive after a while. The levels are generally well designed, with secrets to find and plenty of bad guys to shoot, however many areas look the same so it’s easy to get lost. I also found I had to wander empty levels after killing most bad guys but having to retrieve a key or find a locked door. On the other hand the guns are still fun to use, it still very atmospheric, and blasting through the levels is still quite fun. Later episodes shake things up by adding new enemy types and are more difficult. 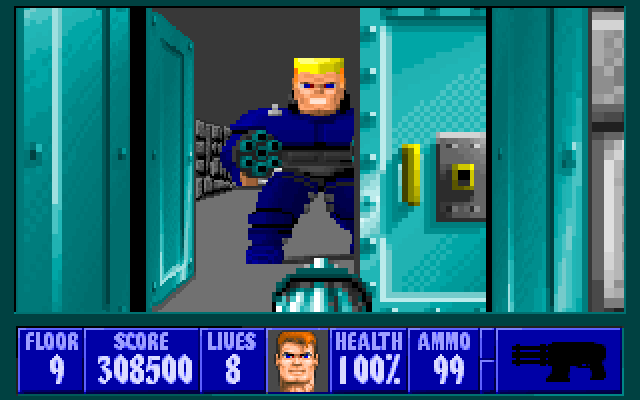 You can play Wolfenstein 3d online at the internet archive, or you can get a copy on steam or GOG. You may have noticed that I’ve been playing with a number of homebrew MS-DOS games lately. This has given me a little more motivation to work on my own project, my simple flick-screen platform game Bob’s fury. The main body of work left is to create the levels for the game and any content required for them. For me this has been the hardest and most time consuming aspect of making the game as it requires a lot of play testing and planning. Recently whilst visiting my folks I had some time to produce a new level, I’ve updated the download to include it. I’m hoping that it won’t take as long to build the next level, I got one pretty decent tip from watching some interviews of Brenda Romero. Basically the tip is starting at the end/goal and build outwards from there. I had been doing the opposite, which made the process harder, partly because you have to keep where you’re going in mind before having built the area. The other stumbling block I have is coming up with ideas for levels. There’s not much I can do to stream line this, so it will probably continue to be a road block. I will probably simply make fewer levels for each “episode” so I don’t require as many ideas. I’ve also released the level editor for any one interested. You can find it here. Today I’m looking at another homebrew game, Dungeons of Noudar 3d made by Daniel Montiero. It’s a simple dungeon crawler game with a similar visual design to something like Eye of the Beholder. After playing with it a while I think it’s in need of some polish, but is really quite impressive from a technical standpoint. Hardware support is VGA only for the graphics. The main 3d landscape is rendered in a large window and it features fairly detailed geometry. Compared to the basic 3d dungeons that many RPGs had, it offers quite a bit more visual detail. Whilst it doesn’t render fast enough to be comparable to any FPS games, it works quite well for this style of game, which typically doesn’t update the screen as often. The sprite artwork is nice at a distance, but when enemies or items are up close it can be very blocky. Hardware support for basic sound is included for PC speaker, Adlib and the OPL2LPT. I tried both the PC speaker and Adlib whilst playing using Dosbox. I found that the sounds varied in pitch and length a little, perhaps because of the emulation, it usually coincided with a delayed screen update. The sound effects are fairly basic, and although they sound fine you don’t miss anything by having them turned off. Unfortunately you can only select the sound support with a command line parameter. 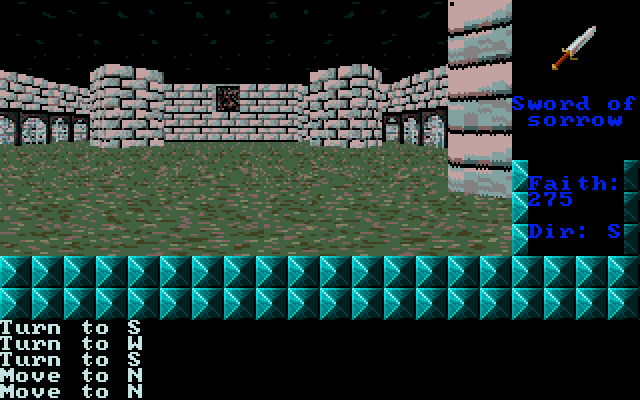 The game play consists of some basic puzzles and some bad guys to fight, both within relatively small levels. Puzzles basically involve finding ropes to cut that open doors. Generally this just requires you to explore the level. Enemies roam the levels, the first ones you encounter don’t seem to be very active, but after a few levels they will chase and attack you. Later enemies require you to use specific weapons in order to damage them. If you encounter them without the weapon required you’re generally boned. Luckily you will find the right weapons if you explore the levels thoroughly. There are some issues which make it more difficult to enjoy. I got stuck on the 3rd level, the prison, and even though I had cut all the ropes I couldn’t find where I had to go next. In a few other instances I reached the level end without having the chance to fully explore the level and find all the items. I think some kind of visual indication on the exit door/location would help greatly, both so you know when you’ve found it and so you don’t accidentally finish a level before you’re done exploring. I think it could also use the capability to save and load a game in progress, or continue from a check point after death. Not having these features really limited how far I could progress as I’d have to start from scratch each time I started to play. I’d have liked to get further into it, as it was getting more interesting at the point I got up to. Issues aside Dungeons of Noudar 3d whilst a bit slow to start is an enjoyable experience. The 3d renderer is fairly impressive in it’s capability, even if it’s not fast and the basic game mechanics do work and play quite well. It’s not a deep experience by any means, but it you enjoy dungeon crawlers this might be worth a download. You can get it from his website here. Today’s game is an early CGA game originally made for IBM in 1984 by D.P. Leabo and A.V. Strietzel. It was included on software sampler disks that came with many IBM PCs. You play as Freddy who has to rescue all the road runners before the maintenance bots gone rogue harm them. It’s a little bit like Lode Runner, but has a number features that make it different. I saw LGR playing it on a video where he was unboxing a NOS IBM PC and thought it looked interesting. Being an early IBM PC game, the only graphics supported are CGA, primarily as the other standards hadn’t arisen yet. It runs on the slowest of IBM machines, so there is no scrolling and each room is the size of a screen. Performance on an old 4.77Mhz machine should be quite reasonable with perhaps a little graphical flicker. The game timing works independently of the CPU, so faster machines can play with out issue. Artistically the graphics are quite well drawn for CGA, although you will notice everything is generally a combination of two colours in stripes. This was for use with composite monitors that were capable of showing 16 colours. I can’t show what it would have looked like because dosbox doesn’t display this particular program in its composite emulation mode. PC speaker sound is used for similar reasons, there just wasn’t anything else at the time. The short snippets of music and sound effects are surprisingly quite charming, and suite the game quite well. The game play has some common ground with Lode Runner, you have to collect the road runners rather than gold and the levels consist mostly of platforms and ladders. There is a time limit for each screen, and you can burn holes in some floors in much the same way, but the enemies (maintenance robots) don’t fall in, they stop and wait for the floor to reappear. On the other hand there are some significant differences. The robots are much less aggressive in their pursuit, and move significantly slower. The levels are larger than a single screen and you use doors to travel. White doors teleport you to the other white door on the screen and are an excellent way of avoiding being caught. Magenta doors travel to other screens within the level, once you collect all the road runners on a screen a second magenta door appears. You only finish a level once all the screens are cleared of road runners and the power-ups that freeze the robots. When it came to the game controls I was quite lost at first, as there is basically no documentation with the game telling you how to play. I managed to work out basic movement fairly quickly, as they are just the arrow keys, but it took some time to find out how to jump and make holes in the floor. This left me puzzled as there were road runners I couldn’t reach without using these features. 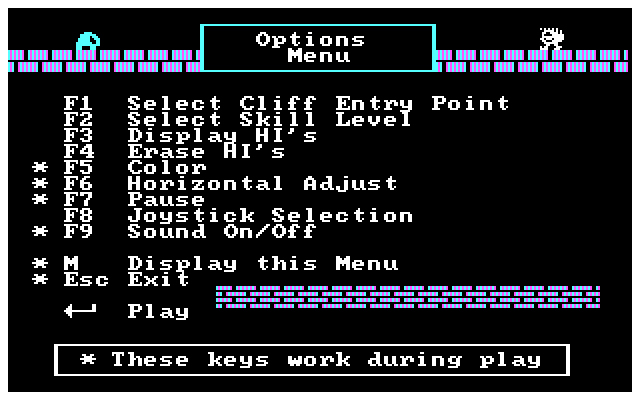 You jump by pressing the space bar and left or right, which will jump over a one tile gap. Pressing space bar on its own will dig a hole in the floor in front of Freddy, as long as it’s a floor where that is possible. Once I learned the controls they worked quite well, just the lack of documentation made it hard. The other main issue is that Freddy basically only moves in whole tile increments. If you release the key whilst he is half way between tiles he will keep going until completely on the next tile. This only really caught me out at the edges of platforms as I’d overshoot and fall off the edge. The level design is generally fairly good, there aren’t many areas where you can get trapped by a single bot. Although if you set the difficulty level to normal or hard there are more bots chasing you which is significantly harder. The bots behave differently to the bad guys in Lode Runner in a way which makes it harder. They spread out and cover a larger area of the screen. Where the Lode Runner bad guys can be bunched together with some clever movement, effectively making them easier to avoid. Luckily you have a couple of tools in avoiding the bots, such as digging holes, using doors (when you can reach them), and the dots that freeze the bots. I’d say Freddy’s Rescue Roundup is a bit of a hidden gem despite IBM making it public domain and the fact it was distributed with IBM PCs. Most of the usual places I look for DOS games didn’t have it, but it can still be found on some abandonware sites . It could be because of its age, it’s not as well remembered, either way it’s certainly interesting and still quite fun to play. If you happen to own an old PC with CGA and possibly a composite monitor this is worth giving a go. Today’s game is another homebrew made by Daniel Remar in 2017. It’s quite interesting as I’d describe it as a turn-based puzzle platform game, an odd combination indeed. He wrote it using QBasic and has included the source code along with some binaries compiled for 16bit MS-DOS as well as 64bit windows (using QB64 as the compiler). In technical terms the game is fairly basic, it’s essentially using a 40×25 text mode with 16 colours and the PC speaker for sound. Whilst simple, it’s very effective, and the game is quite nice to look at for a text mode game. Sound is quite sparse, with few effects at all, but they are appropriate and don’t become annoying the way some games can become. Looking at the code, this could be ported to anything with a decent Basic interpreter and a 40 column display mode. What makes the game odd and interesting is the mechanics of it. Your character only really has two goals, collect gold and reach the exit. In order to do this you need to jump around a small level avoiding obstacles that trap or kill you. The player moves one step at a time. The jump mechanic is a bit hard to describe. You have a maximum jump power, which is the number of steps you can travel vertically. For each step vertically you take you can take a step horizontally left or right. Once out of steps you must fall to the ground. You can fall at any time in the process by pressing the down arrow. It’s a bit tricky at first, but once you get the hang of moving around it works quite well. The level design works well with these mechanics to make for a challenging but not punishing experience. If you do happen to fall foul of a trap, the level is simply reset without any further penalty. The traps are fairly basic, there are spikes, Laser barriers that can be toggled, and some moving obstacles where timing is critical. Some areas can be inaccessible until you’ve increased your jump power, and others require a bit of thought to find your way in, but in general the puzzles are solvable in a reasonably short period without being easy. 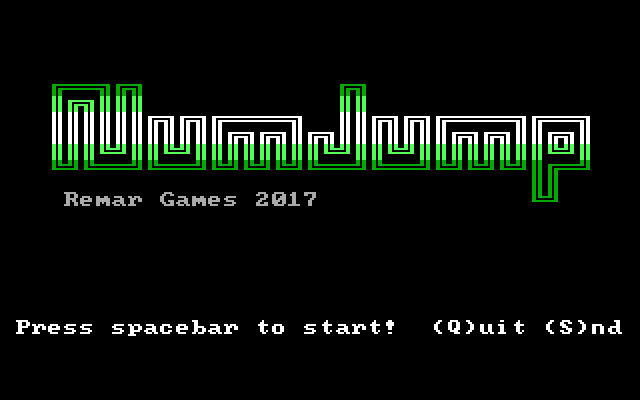 Numjump is fairly short, you can finish it within an hour, but the length feels just about right. You get just enough of each type of hazard and puzzle to feel satisfied, but not so much as to become repetitive. If you’ve finished the game, you can go looking for all the secret dots, or make an attempt at collecting all the gold for the reward of a secret level, one for each achievement. It’s fun and well designed, so I’d say it’s definitely worth a go. I downloaded it from the Dos Haven site here, the official site there is linked to the authors twitter account.